A panel discussion on Tunisia's economy, political dynamics, and upcoming elections. The political alliance between President Beji Caid Essebsi and Ennahda party leader Rachid Ghannouchi, which has anchored Tunisia’s democratic transition since 2014, fell apart in late September. The collapse lays the groundwork for dramatic political change ahead of 2019 presidential and parliamentary elections. 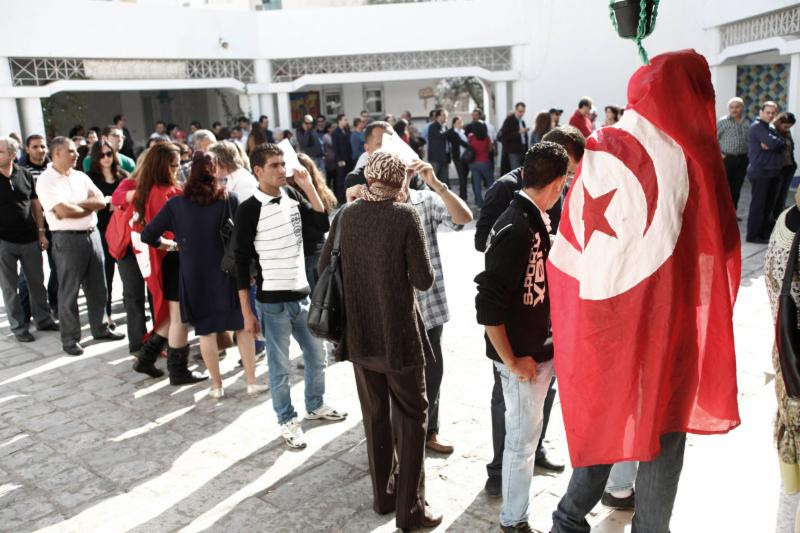 What new forces are contending to shape Tunisian politics? What are the key issues at stake and how is Tunisia’s struggling economy influencing the electorate’s mood and its fragile democratic transition? The Middle East Institute and the American Tunisian Association are pleased to host a panel discussion with three leading Tunisia analysts to explore these and other issues facing Tunisia today. Monica Marks is a Rhodes scholar, PhD candidate at Oxford University, and leading expert on politics and Islamist movements in Tunisia and Turkey. She conducts research in Arabic, Turkish, and French. From 2012 to 2016, she was based in Tunisia, where she has conducted over 1,200 interviews with Tunisians ranging from cement factory owners and small-town police officers to leftist revolutionaries and Salafi jihadists. This research forms the backbone of her dissertation and forthcoming book, which explores the role of Islamism in shaping Tunisia’s democratic transition. A former Fulbright scholar to Turkey, Monica is currently based in Istanbul, where she has taught as a visiting professor in the Politics and International Relations department of Istanbul’s Bogazici University. She also co-directs The Exchange, a series of professional immersion courses on the politics of Libya, Tunisia, and Iraqi Kurdistan. These “politics in the field” courses bring academics, diplomats, and analysts from around the world to the region itself, where they engage in dozens of intensive Q&A meetings with local experts and leaders across the political and ideological spectrum. William Lawrence teaches African and Middle Eastern security and North African politics at George Washington University’s Elliott School and lived immersively in North Africa for twelve years, including several several years in Tunisia in the 1990s and 2000s. He served as Crisis Group’s North Africa director, Control Risks’ MENA Associate Director, the Center for the Study of Islam and Democracy’s MENA programs director, and State Department senior advisor for global engagement, co-creating the Global Innovation Through Science and Technology Program and the Maghreb Digital Library. Previously, he served six years as officer in charge of Tunisia Affairs and in charge of US-Tunisia science and technology relations. He co-authored After the Uprisings: Political Transition in Tunisia, Libya, and Yemen, has published on North Africa in Foreign Policy, the Guardian, Jeune Afrique, Rue 89, Al-Hayat, and Sharq al-Awsat and with the Center for Strategic and International Studies, the Arab Center, the Washington Institute for Near East Policy, and the Oriental Institute at Oxford and appears frequently on NPR, VOA, BBC, France 24, and Al Jazeera. He has testified three times on Tunisia before the Senate Foreign Relations Committee and House Foreign Affairs Committee. He also co-created six MENA-related films and fourteen albums of North African music, including the first internationally-released Arab rap song. Jonathan M. Winer has been the United States Special Envoy for Libya, the deputy assistant secretary of state for international law enforcement, and counsel to United States Senator John Kerry. He has written and lectured widely on U.S. Middle East policy, counter-terrorism, international money laundering, illicit networks, corruption, and U.S.-Russia issues. In 2016, Winer received the highest award granted by the Secretary of State, for “extraordinary service to the U.S. government” in avoiding the massacre of over 3,000 members of an Iranian dissident group in Iraq, and for leading U.S. policy in Libya “from a major foreign policy embarrassment to a fragile but democratic, internationally recognized government.” In 1999, he received the Department’s second highest award, for having “created the capacity of the Department and the U.S. government to deal with international crime and criminal justice as important foreign policy functions." The award stated that "the scope and significance of his achievements are virtually unprecedented for any single official."